Review date: 25 February 1999. The retail release of the Pentium III (originally codenamed "Katmai") is a few scant days away, and I finally managed to get my hands on a pre-release processor down here in backward little Australia. It looked like an OEM Pentium II, with a plain yum cha heatsink and fan. Only a scribbled sticker on the back made clear that this was a 500MHz Pentium III. It's not much to look at. This pre-release P3 came with a yum cha Sanyo fan and heatsink strapped onto a regular Pentium II cartridge back. It's reported that the retail processors come with a heatsink, but no fan, and run rather hot as a result. The Pentium III is based on the same processor core as the Pentium II, which in turn is not tremendously different from the old Pentium Pro. The reason why P-II computers are so much faster than P-Pro ones is that the P-Pro topped out at 200MHz, whereas the P-II started at 233 and the current flagship model runs at 450MHz. When the P-II was first released, P-Pro users didn't have much reason to upgrade. The new processor was expensive (and needed a whole new motherboard), and 233 or even 266MHz wasn't enough of a performance improvement to justify the expenditure for many. The same argument applies for the Pentium III. The P-III at doesn't require a new motherboard - it has the same Slot 1 connection as the Pentium II, so it'll work on pretty much any P-II board - but the only P-IIIs that'll be available at the initial release will be the 450MHz and 500MHz ones, and frantic benchmarking efforts by hardware aficionados the world over have demonstrated that these processors don't offer much more than a Pentium II 450 for most applications. A 450MHz Pentium II runs slower than a 450MHz P-III, but only by about 5%. The P-II 500 is about 11% faster again, as you'd expect. It gets worse. Intel's highly overclockable Celeron processors, especially the now-hard-to-find 300A, are well known to be very likely to run happily at 450MHz, giving performance indistinguishable in almost all applications from that of a genuine P-II 450, but for far, far less money - $160 Australian for a 300A as I write this, against more than $1100 for the P-II 450. The P-III 450 is slated to debut at a price point slightly below the current price of the P-II 450 - presently, a bit less than $1200 - with a concurrent drop in P-II prices. The P-III 500 will cost something like $1650 (remember, I'm talking Australian dollars here). So why the heck would you buy one? The Pentium III does offer something that the P-II doesn't have - Katmai New Instructions, or KNI. If you remember the hoo-hah surrounding Intel's earlier MMX, you'll hear more of the same about KNI. This time, it may even be justified. Like MMX, KNI is extra processor instructions that can make some applications - mainly games - significantly faster. MMX Pentiums were slightly faster than their non-MMX predecessors. This was partly because of improved manufacturing processes, but mainly because they had twice as much Level 1 cache memory. 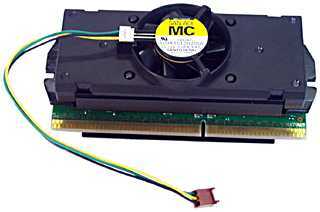 The Pentium III has no more cache RAM, Level 1 or 2, than the Pentium II, and so it enjoys no such advantage. It's rumoured that later P-III processors will have double the P-II's 32k Level 1 cache, but it remains to be seen whether this actually happens. The P-III has the full MMX instruction set, like the P-II, but adds another 70 special KNI instructions and can do floating-point and KNI/MMX instructions simultaneously - earlier processors have to change modes. Switching from MMX to floating point and back takes too long for MMX to be useful in many floating-point intensive applications, like 3D games. The simultaneous mode that comes with KNI solves the problem. KNI, like MMX, only does its thing if software specifically supports it. Precious little software does, so far. There are a couple of KNI-supporting games - the real-time action/strategy hybrid Wargasm, the upcoming Descent III - and new video drivers like the recent Detonator drivers for nVidia's TNT chipset are also alleged to use KNI. At present, though, KNI support is patchy, with mixed reports on the actual speed increases. At best, 25%; at worst, nothing. The Detonator drivers do seem to be faster for most people, including me, than older drivers - but they're faster across the board, on all processors, and don't seem to do anything special on a P-III. Windows 2000 will support KNI natively for video playback and other such tasks, and there'll be a patch for Windows 98 as well. In the meantime, though, KNI's just an oddity. Watch this space. Another jargon-heavy P-III enhancement is "Memory Streaming Architecture", whose purpose is to speed up applications that move a lot of data and also use a lot of CPU time, like video encoding and playback. Intel quote a 10% to 20% performance boost for such applications. If anyone has verified this claim, I haven't heard. Like the Pentium II, the Pentium III can be used in multiprocessor applications. Most users don't care at all about this, but for heavy-duty server and graphics applications it's important. The bargain basement Celeron isn't meant to be useable on multi-CPU motherboards, but it can be done - see here. The P-III also has something else that the P-II doesn't - a built in serial number. Intel's proudly announced this system, which can report the serial number to querying software and positively ID processors. Intel then devoutly wished they hadn't proudly announced the ID number, as howls of rage rose from privacy and civil liberties activists, liberally spiced with observations that faking an ID number wouldn't exactly be the programming task of the century. The upshot of the whole debacle was that the P-III's release date was pushed back, and all shipping processors will have the ID feature turned off by default. You can turn it on, if you want, with a special utility. Judging by reports from prerelease processor evaluators, the P-III is about as overclockable as the P-II. In other words, not terribly. It's a multiplier-locked chip, like the Celeron, so you overclock it by using faster front side bus (FSB) speeds than the standard 100MHz. We've all been spoiled by the marvellous Celerons; a processor that can only run one or two FSB steps faster than its label says (504 or 527MHz for a 450MHz processor, for instance) doesn't excite us any more. As with P-IIs, it seems the most you can count on for a well-cooled P-III is one step higher than the sticker speed. Some lucky folk have managed to do better, but you certainly shouldn't count on it. And since it appears that even retail boxed P-IIIs will not be coming with a fan on their heatsink, overclockers will definitely need extra cooling. The 450, 500 and 550MHz Pentium III CPUs will use the same .25 micron fabrication technology as the P-II 350 and higher. Shortly, though, .18 micron P-IIIs will become available, and the clock speeds will start to climb. With a future standard Front Side Bus (FSB) speed of 133MHz (presently only used by extreme lunatic fringe overclockers), we'll see the P-III reach for the magical 1GHz figure. But it's a long way short of it at the moment. If you feel an absolute burning Freudian urge to get your hands on the newest, shiniest and most virile processor you possibly can, the P-III is for you. But if you're saner, you'll note that a $160 (Australian dollars) processor can, very likely, be overclocked to give you almost all the performance of the alarmingly expensive P-III 500, and with the money you save you could buy yourself a 17 inch monitor, a 10Gb hard drive and another 128Mb of RAM. If you're happy to spend maybe twice as much as the price of a P-II 450 for 20% more speed, be my guest. If an overclocked Celeron will do you, make that ten times as much. Me, I'm sticking with my faithful 300A until the really fast P-IIIs hit the streets. Appalling general value for money compared with Celerons, overclocked or not. 450 and 500MHz versions not that much faster than a Pentium II. FSB: Current IBM compatible computers set their speed as a product of two numbers - Front Side Bus speed, and a multiplier. The Front Side Bus speed, times the multiplier, gives you the actual internal CPU speed. A recent 400MHz computer, for example, has an FSB speed of 100MHz, while the CPU runs internally at a "4X" multiple of this speed. A 333MHz machine has a 66MHz FSB (actually 66 and two thirds, but that's awkward to type), and uses a 5X multiplier. 100MHz is the highest currently specified standard FSB speed. Many current motherboards, however, support faster FSB speeds. Overclocking is using higher bus speed and/or multiplier settings than your processor is meant to support.